This cream filling is the ultimate cream filling. It’s rich and creamy, without being too sweet. Perfect filling for pastries, trifles, cakes or any other cream filling dreams you have. It’s also a staple for these Chocolate Crepes. This recipe is also one of our top 5 recipe on our blog- for a reason! Make this bad boy today and you’ll see why! Ingredients for your cream filling. and a small box of instant vanilla pudding. 3.4 oz. To start you will also need to use a KitchenAid or a handheld mixer. 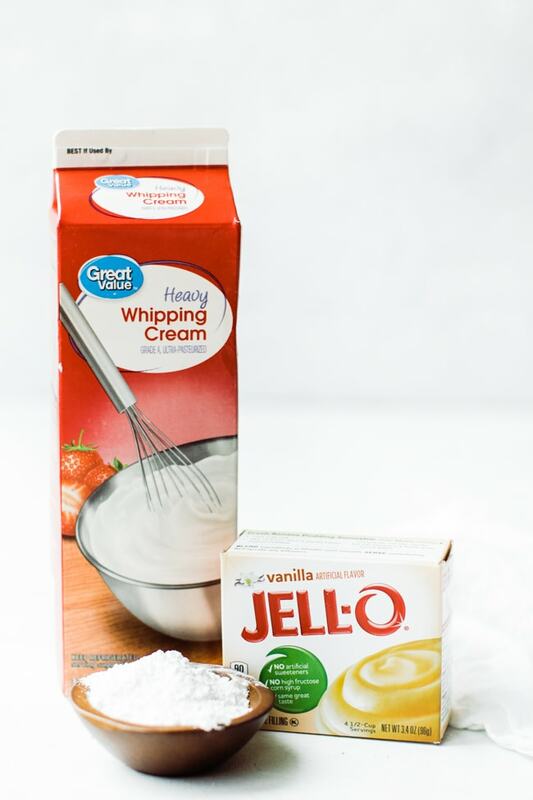 Add your powder sugar to your cream while mixing. 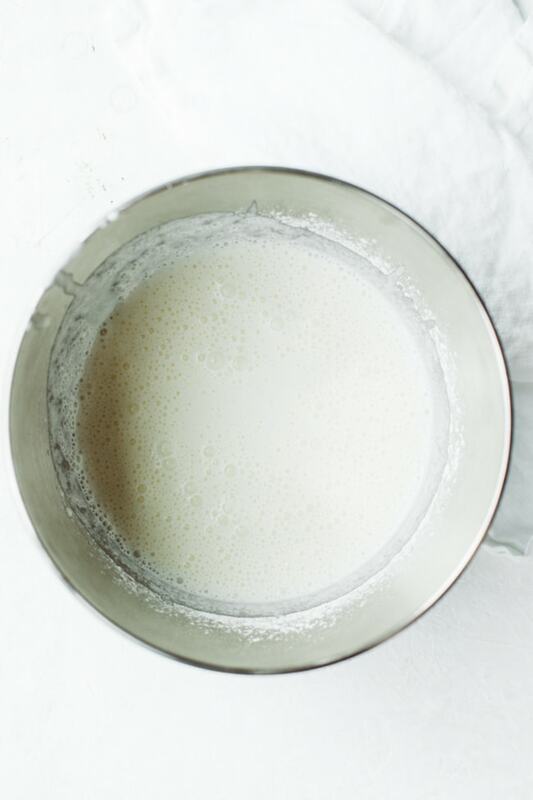 Mix for a few minutes to thicken up your cream. Then slowly add your box of vanilla pudding. It’ will start to get bubbly and light. Let it beat for about 30 seconds more, it will smooth out and the pudding will dissolve. It’s done! You don’t want to keep beating and over beat it. 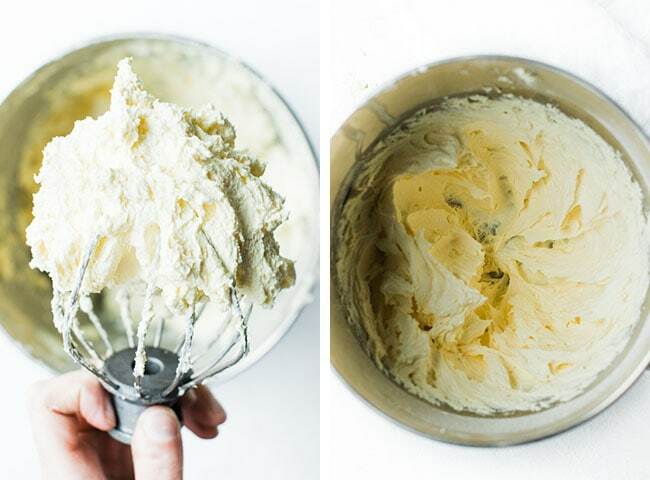 Once it is smooth and creamy stop the beater. Do I need to refrigerate cream filling? Yes, because it is made with milk product keep it in the fridge. You can store it in an air tight container, or in pastry bags ready to pipe until you can add it to your desserts! Do I need to refridgerate my pastries and cakes after the cream filling is in? If your dessert will not be eaten within a few hours of making I recommend refrigerating it. Especially if it needs to sit over night or a few days. Use it with pancakes, waffles, french toast (stuff the french toast!) 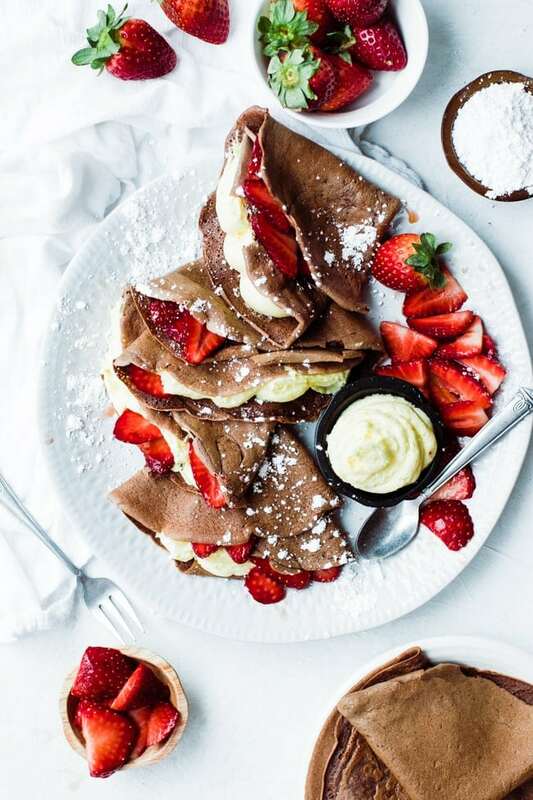 or these delicious chocolate crepes! Let us know your thoughts, questions and if you liked the recipe! If you tried this Cream Filling Recipe or any other recipe on the blog then don’t forget to rate the recipe and leave us a comment below. You can also follow us on Facebook, Twitter, Instagram and Pinterest to see what else we’re getting up to! Start whipping the whipping cream with electric mixer on high. Add in the powder sugar. As it starts to thicken, add in the powder vanilla pudding. 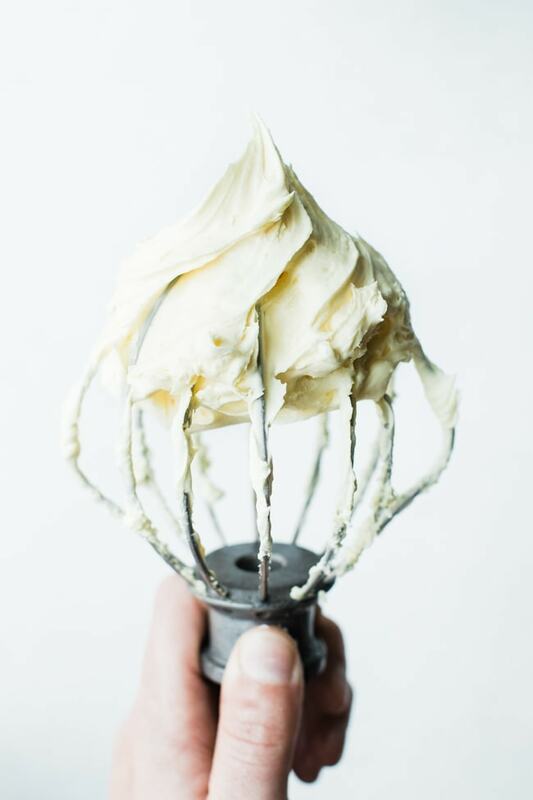 Continue mixing till smooth and creamy. If making ahead and wont be eaten for several hours refrigerate the cream filling, or the desserts made with the cream filling until ready to serve. Can pull out of fridge 30 -60 minutes before serving so dessert can come to room temp. I would love to try this inside cream puffs! It looks delicious! It’s pretty darn delicious :) Thanks for your Comment Gina! Can you use it on cake? Yes you can . Really good on poke cakes. Going to be trying this arty the end of the month. What size box of pudding? And did you use instant? Yep! I used an instant, and the box was the smaller of the two sizes. Could you use chocolate instead of vanilla? Yes! I’ve made this with choc HERSHEY pudding and it was soooo yummy! Both in crepes and cream puffs. That’s how my mom used to make filling for these too. Awesome dessert! How much filling does this make? So I tried this and it didn’t turned out so good.. Do you prepare first the vanilla pudding? When reading “add in the powder vanilla pudding.” I just added the powder to the whipping cream and nothing happened.. I just made this for some cupcakes and it is INCREDIBLE!!!!! So easy and soooo good! You will want to sit down with the bowl and a spoon. Maybe one nice big wooden spoons! It is awesome and could very easily be made with another pudding flavor- Chocolate, Pistachio (as you mentioned), Banana, Lemon, Cheesecake, etc…. Thank you for this recipe!! oh Suanne! That makes me heart happy! So glad you loved!! Keep refrigerated? Does this mean i have to refrigerate my cupcakes after they are filled? Help i was just making this for work tomorrow. Sorry Jody! I just saw your comment, technically yes.. with the milk content it should be refrigerated. However with the sugar content it’s pretty stable. If you are worried I would play it safe and keep chilled. 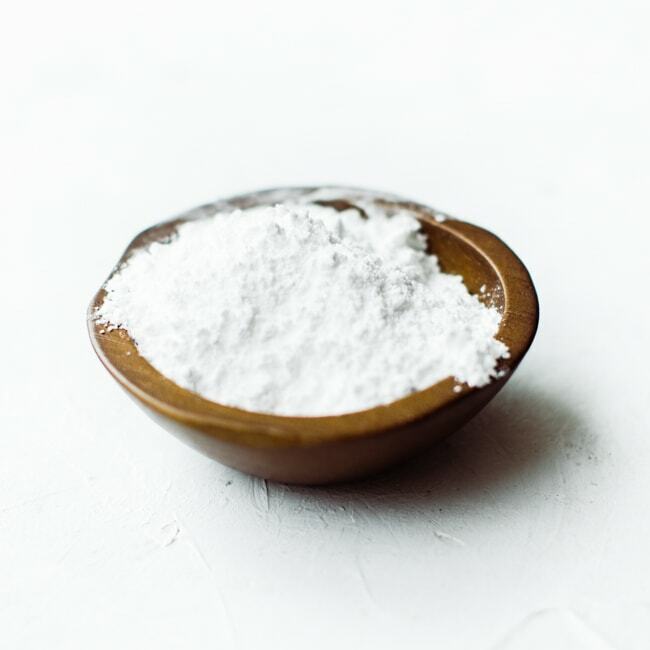 Is the powdered sugar 2 teaspoons or 2 tablespoons? Hi Peggy ! Capital T is for Tablespoons! I thought tablespoons was tbsp / tbs and tsp is teaspoon. Hi Gail! You are completely correct! Tablespoons can be abbreviated tbsp, tbs or capital T. Most common is tbsp. Christy!! That is a genius idea!! I’ve never thought of using it for a cake filling!! I bet it was delicious.. going to have to try that the next time I bake a layer cake. And do let me know about the chocolate! I would love to try the recipe . Could you please tell me which brand of instant pudding have you used ? Just to make sure to make it as you did. Hi Julia! 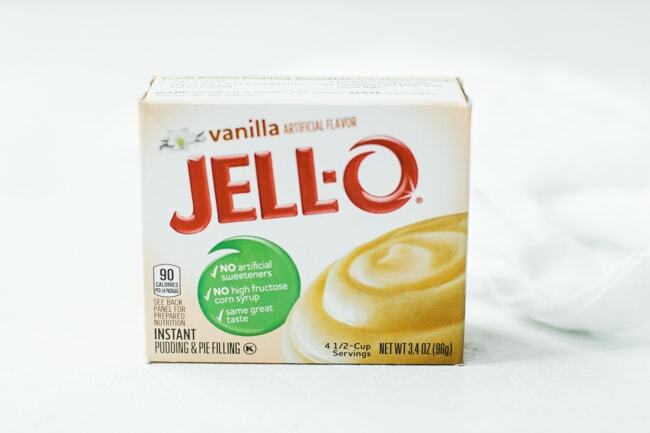 I use Jell-O Instant pudding, and the 3 oz size. Hi Ivy! I have to be honest I’ve never tried it as a frosting, it’s much more creamy and soft than a buttercream frosting. I would be nervous using it if your making a cake for a big occasion?! Or maybe give it a test run before hand. If you decide to try it let me know what you think!! I really curious! On of our other commenters stated that she used it as a cake filling and it worked well! Is it possible to make this filling without a mixer? Hi Caroline, I’ve never tried! 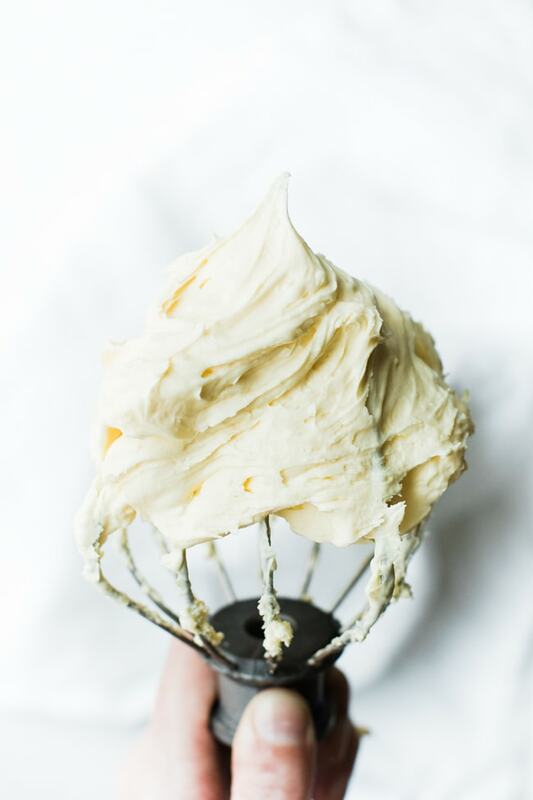 I imagine with a great whisk and a lot of whipping it could happen but the power and speed from the mixer does help create that thick creamy texture. If you have success let me know! Hi Lisa, Not sure what thicking cream is.. but whipping cream is usually what most stores carry. 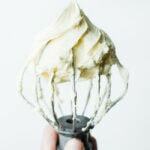 Whipping cream is what you can make regular whipped cream from. Hope this helps?! Just made this for the first time and it is absolutely delicious. I can’t stop licking the beater. Thank you! It’s perfect! Can I use the already made vanilla.pudding? I don’t think pre-made pudding would work well. There would be too much moisture and you would end up with a very runny mix. Holy Moly! This is so incredible and delicious! It is so easy to make and I only made half since I didn’t need that much but I still ended up using the whole box of pudding. I used lemon pudding instead for my lemon cupcakes! Thanks! Thanks for your comment Laurie, It is pretty fast and easy! And great to know about the chocolate pudding- that will save a lot of readers some time! Hi Denise, This would be very yummy on cupcakes! My only concern is that it is lighter then a regular buttercream frosting and probably won’t hold it’s shape too well. I would give it a test run before the party to make sure it functions the way you want. My only other suggestion would be to increase the powder sugar to help stiffen things up a bit, but again, I’ve never tried it and am not sure the outcome. Give it a test and let us know how it turned out! I’m curious! Thanks so much!!! So glad you love. I’m curious, did you use heavy whipping cream or just whipping cream? I’ve used both but tend to lean towards the heavy whipping cream! Hi Annette, I’ve never bothered to chill my bowl and have great results! I can see how that might help though! When is it a good time to pipe it into the cupcakes and art how much to avoid tearing them? Awesome filling! It has such a wonderfUl taste. It is my go-to recipe for fillings. Thanks Angelia- It really is a versatile filling! I appreciate your comment! I need a good cream filling for CUPCAKES for my son’s graduation party. This sounds like a great one but I wouldn’t be able to keep them in the refrigerator as I’m making 300 of THEM…How long can then be left out before they wouldn’t be any good? I would say they should be fine for a few hours! It might be a good idea to make a test batch before hand (if time allows) and see how the filling holds up not being chilled. Make tHis filling im making a birthday cake for my sOn a lemon and Vanilla cAke wiTh a rAspberry Filling a the your mousse to go in between each layer. And a butter cream frosting..
Made this today with the Oreo cookies n cream pudding. I put it on a chocolate cake. It was a big hit!! Thank you!!! Hmmm . . . would it be the same if I didn’t use instant vanilla pudding ? Because where I live , we don’t normally have instant vanilla pudding on sale . But , is there any other substitute to the instant vanilla pudding ? I made this as a filling for crepes and it was absolutely delicious. I can’t wait to try it with other flavors of pudding. This is simply outstanding! I made it and put it in chocolate shells with raspberry sauce. It’s easy to make, very versatile and a recipe I will definitely use again and again. I want to try this filling as a filling for canolli made from pizzlles… Have to give it a try! Sounds really nummy! Do you think it would make a difference using sugar free pudding? No! It should fluff up the same :) it will just have a slightly different taste. Turned out DELICIOUS! I used As a filling for a sweetened condenSed milk cake, then served with Whipping cream and berries. Yum! Hi, I am looking for something creamy to put in between my layers of jello for my Dr. Seuss parfaits, do you think this would be a good choice? yes! its nice and thick it would hold up well!! how many grams that you used for instant pudding mix? yay!! this makes me so so happy!! Tried this to fill a donut cand for a birthday. Best stuff ever!